Family Court Philosopher #78: Get Off the Bus, Gus! 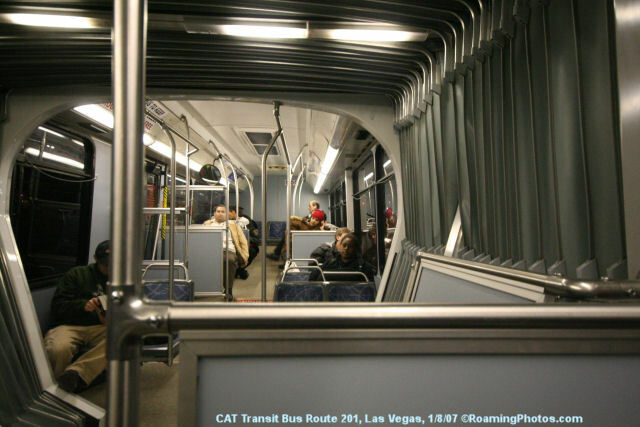 To the surprise of many, Las Vegas has a pretty good local bus system. Routes follow all the major cross streets, and the buses are frequent and reasonably on time. For one low fare (just twice the one-way fare), you can travel the bus system all day long, taking as many trips as you want. Once you are on the bus, you don't have to worry about traffic. You can read a book or daydream because someone else is doing the driving for you. Another advantage of the bus is spiritual: If you are in the right frame of mind while taking it, you can sometimes achieve Nirvana. This happened to me while taking the bus last night. In a moment of enlightenment somewhere along Tropicana Avenue, it occurred to me that buses explain everything! Buses are one of the main things we are all struggling with on the great highway of life. We study the schedules and try to scrape together the fare, when in fact the whole bus system is something of an illusion. Buses serve a role when we need them, but as soon as the opportunity arises, the most important thing we can do is get off the bus. It is better to find another way. Have I lost you? Let me step back and explain to you how buses work, and then maybe you'll understand. Buses operate along a fixed route and are designed for the needs of many. They usually beat walking, but they are not as convenient as driving. On the bus, you can usually get where you want to go, but you have to adapt to the published route and schedule, and you have to be patient. Travelling by bus can take between two and five times longer than driving a car because there are so many stops along the way. These stops are important to the other bus riders but not to you. Driving a car is usually preferable, because you can travel wherever you want, whenever you want, skipping intermediate stops and transfers. In a car, you can also change your itinerary in mid-journey. If you see something interesting along the way, you can pull over immediately and take a look, whereas the bus doesn't usually give you that option. The trouble with cars is that they are complicated machines, expensive to own, run, insure and maintain. Driving a car also exposes you to a lot of risks that you don't have on the bus, not the least of which is losing your way. In a broader sense, "buses" are patterns of behavior that have been established by others, while "cars" are the routes we plan for ourselves to serve are own unique needs. For example, education is a bus. Once we sign up for a class, our learning path is programmed for us and the driving is taken out of our hands and placed in the control of a "teacher." We don't have to think about where we are going; we just have to do the assignments. This is not the most efficient way to learn, because you are proceeding at the pace of the group and have to suffer through many unnecessary stops, but at least it gets you there. A career in any established profession is a bus. Once we decide to become a doctor, lawyer or electrician, then our life is pretty much mapped out for us. Marriage is also a bus. Once you sign on to the concept, then there are a whole set of established patterns you are supposed to follow. Once you step onto a bus like that, it can be very hard to step off. Every day, we are taking a variety of little buses that we hardly notice. If today is someone's birthday, the bus tells us what to do: obtain a cake, put some candles on it, then sing "Happy Birthday" to them. A huge portion of our daily lives is pre-programmed this way. Whenever a problem arises, there is an acceptable ritual to deal with it. It's not necessarily the best way to deal with the problem; it's just the way things are supposed to be done. Our upbringing supplies us with some of these pre-packaged routines, and advertizing and media give us even more. If you discover you have dandruff; what do you do? You can get on the Head & Shoulders bus or the Selsun Blue bus. We don't think about how these buses work or whether dandruff is bad to begin with. Whenever we encounter something we don't know how to deal with, we join some club or established program that claims to offer a solution. Religion is a bus, Big Time. If you are confused about the meaning of life, there are plenty of faiths that claim to give you the answers. If you sign up for the Catholic Church, the Mormon Church, the Scientologists or the Wiccans, you may not become any less confused in the long run, but at least they give you something to do. There are ceremonies to follow and words to speak, and it feels like you have boarded a bus that is going somewhere. Religion can be very reassuring because it lets you turn over the driving to someone else. You just have to sit back in your seat and put your faith in Jesus. At least everyone says that Jesus is driving the bus, but are you really sure? Have you looked up in front to see? Isn't it really a committee of people who are driving the bus, claiming to represent Jesus? Isn't the bus just going in whatever direction that serves the needs of those people? The trouble with buses is that you have to decide on your destination before you start your journey, then you have to put your fate in the hands of the driver. When you sign up for law school, you are deciding that 20 years from now you are going to be happy being a lawyer. It may or may not turn out to be true, but how do you know? How can anyone make a decision like this so far in advance and with so little information? When you take the bus, you are trusting in the wisdom of others to decide what is best for you. Every bus ride requires putting yourself in someone else's hands—sometimes a specific person, like a teacher, or sometimes a faceless system. The goals of the people who run the bus system aren't necessarily the same as your goals, so you always have to be wary of every bus you board. We all need buses when we are young. We need simplified patterns and rituals to help us get us started in the complexities of life. Every child, for example, needs some form of ritualized schooling. This is a quasi-religious system at first: You do things because Authority tells you to. At the beginning you don't have to understand why; you just have to have faith. As you grow up, however, you need to be getting off the bus whenever possible. This is scary sometimes, because when you don't have a bus, you have to plan your own route, and there are lots of ways you can screw up. The benefit, however, is that by designing your own path, you can serve your own needs far more efficiently than any pre-packaged itinerary. When I took my first trip across the United States at the age of 19, even the bus was too confusing for me. Buses cross the country in so many different directions that it is hard to know which way to go. (It can be especially confusing when you are still lost in the fog of adolescence—as 19 is!) Instead I took the train. I bought a two-week railpass and essentially camped on the train for that time. Trains in the United States are very limited (even circa 1979). There are only a few routes, and I remember at the time that I found this to be a relief. The steel tracks, to me, were solid and reassuring, not restrictive. 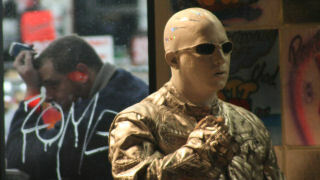 I didn't feel imprisoned, because everything I saw was new to me and I needed a solid structure to help me process it. That's not how I feel today, because my needs have changed. I have constructed my own rules about where to go, and I don't need the rails to guide me. At the same time, I want to be free to make stops and diversions along the way. The thought of being restricted to the rail line has gone from liberating to unnecessarily burdensome. Today, I would be unlikely to take the train in Europe, no matter how efficient their system may be. Looks nice from here, but what are the passengers seeing? Now that I have already seen the highlights and know what to expect, why would I restrict myself to a few limited paths? On travel shows on TV, you see dramatic aerial shots of a trains passing through canyons and dramatic countryside, but you don't get this view if you are inside the train. In a train, you are trapped at ground level, whizzing by the sights at high speed, usually able to look out in only one direction. Frankly, it's not much better than staying at home and watching a travel video. Today, I would just buy a plane ticket, rent a car at the airport, then wing it from there. You can see much more in a car, and the journey is precisely tailored to your own interests, needs and whims. 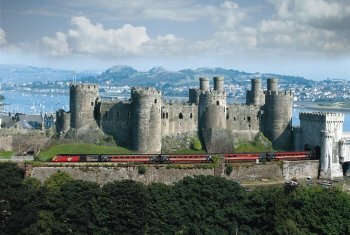 If you pass an interesting castle, you can stop and check it out, whereas the train might just speed by. Not that I am recommending this to everyone. If you are going to "wing it" in anything, some prior experience and local knowledge is necessary, but once you have the skills of independence, you want to use them as soon as you can. I have never comprehended how adults can take "cruises" and "tours." That is where someone sets up your itinerary for you, decides what is "fun" according to their own commercial interests and then arranges it all for you. Many of those tours end up right here in Las Vegas. If the casinos have their way, you will be checked into their hotel for a week and will do whatever activities they have created for you. The Las Vegas economy is built on the huge number of suckers who fall for this proposal. Why would anyone stay at Paris, Las Vegas, when for about the same money and time they could go to Paris, France? Because they're morons, that's why! They don't have the courage or creativity to step off the bus and design their own path. Of course, Paris, the city, is big and confusing, with many more risks and responsibilities than Paris, Las Vegas. They speak that funny language there, and your interactions with the locals are bound to be awkward. It's not as sanitary as Paris, the casino—which presents all the major symbols of the city with none of the grime and confusion. Going it alone is always risky, and frankly many people aren't set up for it. Owning ones own business, for example, is a blessing to some and a disaster to others. Some people probably belong on cruises and in casinos for their own protection—but they are not you and I. As much as you need structure at the beginning of any new experience, this is a temporary solution only, just to get you started—like training wheels on your bicycle. The most efficient mode of living is to seek your own structure whenever the world allows you to. You wouldn't take the bus when you have the option to drive, and you wouldn't sign on to somebody else's plan when you can reasonably make your own. As you examine your current life, how much of what you do is necessary, and how much is a crude and plodding bus route designed by someone else? Are you planning your own route, or are you a prisoner of the bus system? Escaping the structure of others may not be easy, but it is an essential step in your maturation. 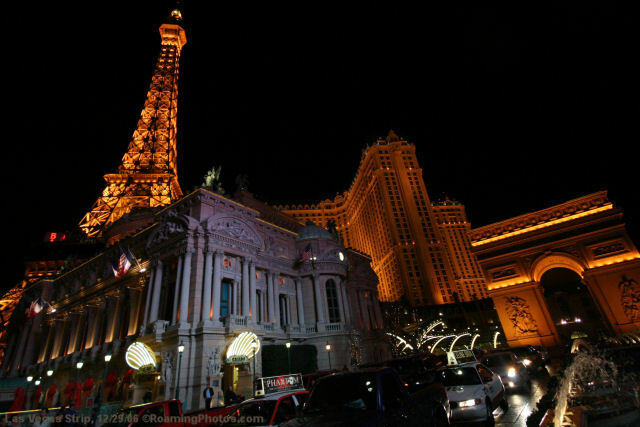 Our Photos of the Las Vegas Strip, including the Paris casino.